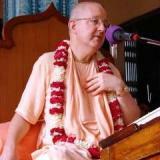 Krsnacandra Dasa – Vrndavan: The Devotional community needs to be developed as a priority. The trend to ‘urbanize’ rather than ‘ruralize’ our devotional community needs to be checked. ISKCON needs to prioritize its agrarian agricultural origin with the required research and development of farming communities set as a priority. In order to do so the thrust to form social developmental projects and training needs to be re-orientated to meet the needs of rural communities. 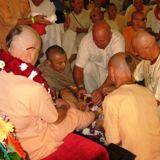 The idea of mass initiation needs to be rationalized with the view to increasing the Krsna Consciousness of the existing members of the community. This means that the ISKCON leadership needs to set priorities that are aimed at sadhu sanga / bhajana kriya and anartha nvritti as opposed to expansion of corporate infrastructure. There is also a priority that our Society develops an education system that is in keeping with the aims and objectives of Srila Prabhupada so that we can make the move from an urban based society that is linked to secular infrastructure, services and employment to a more rural based society. Instead of allowing our children and adults to gain secular qualifications and go on to obtain employment in the secular workforce we develop our own training and employment programmes aimed at giving our children and adults a future within our Society. In worldly matters there has been much talk and discussion on global warming and progressively more governments are taking it as a serious threat to world economies. Over the last fifty years world temperatures have been well documented, and it has become clearly evident that the mean average temperature of both land and water masses have been steadily increasing. There are a number of theories put forward for this increase in world temperatures, but the most convincing has been an increase in ‘greenhouse gases’. Greenhouse gas consists of water vapor, which causes about 36-70% of the greenhouse effect (not including clouds); carbon dioxide (CO2), which causes 9-26%; methane (CH4), which causes 4-9%; and ozone, which causes 3-7%. Simply put, the more greenhouse gases produced, the more gases will collect in the atmosphere. These gases form a layer in the atmosphere that traps infra red radiation from the sun, not allowing it to dissipate into space, but radiating it back towards the earth, thus retaining the heat. The more the density of the layer increases, the greater is its effectiveness to increase the earth’s temperature. The increase in mean average temperature has varied effects on both the landmass and oceans. Weather changes such as droughts and flooding translates as problems for farming and food production. When we look at how these gases have increased we can see a steady increase since the industrial revolution in the late 18th century. The introduction of large scale production of goods meant a revolutionary change in land use. Land use changed from the local ‘village based’ usage model to the large scale farming and mining usage model. Land was cleared for large scale monoculture plantations (cropping), mining for resources or deforestation for energy, timber and animal farming. The subsequent large scale transformation of resources into goods saw dramatic increases in industrial pollution in the form of industrial waste gases. Increased industrial employment opportunities meant rural populations began to ‘migrate’ to urban or city based centers. The economic base of the newly industrializing societies began to shift away from land based economies to production based economies. The politics of world societies also changed in order to meet the needs of the changing economic base. However, the juggling of the ‘states’ economy was no longer a simple matter. The necessity of a monarchic system of Government became less important as the power began to shift away from the gentry (old money) and into the hands of the Nouveau riche, industrialist. The balance of power and wealth now lay in the hands of the politicians and industrialists. However, no matter what the political orientation of the society, the imperative to create a society that was increasingly more hedonistic in orientation was recognized as the most profitable and therefore viable society. This ultimately meant that there was the development of a clear definition of the producer and the consumer. An urban consumer is many times more economically viable than the rural consumer simply because they consume more. Thus the urban model was the most profitable. Hence societies began to train their consumers with urbanized educational models in order to produce more effective consumers. With the development of a consumer based economies came the realization that the consumer has power and influence. Thus democracy became more of a viable solution to control the growing consumer society. This gave the masses a way to think that they are in control. The general public, being trained into conformity by the authoritarian educational system, and influenced by the mass media and various authority structures, became very easily manipulated. As the human population become more affluent they began to consume more animal flesh as they see it as a sign of being wealthy. With the worldwide increase of meat eating, animals and humans were now competing for the cheapest grains on the market. As it takes more grains per head to feed an animal, humans have lost in the market place. Grains are now too expensive for most humans to purchase! Since most humans are poor and vegetarian, this increase in grain prices has left hundreds of millions facing starvation. The animals on the other hand are increasingly more in demand by consumers and so their populations have increased. 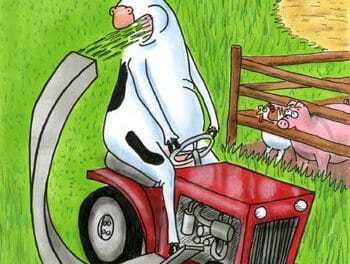 Animals are also the second biggest producers of greenhouse gases from not only methane from their digestive process but also in land clearance for production of grains and other animal feed. Local village producers are also losing in the market place as large scale farming is being increasingly supported by the financial institutions and governments as it is more profitable for them. Increasing land prices, loss of children to urban migration and forced reliance on hybrid seed production leaves the local village producer futureless and penniless. As urban centers cannot support the urban migration, Governmental attempts are being made to rebalance this system via financial incentives and controls of middleman market interference, to bolster the local village producer – but this maybe too late. They are also looking at regulating the large scale production farmers who have better access to finances / professional assistance / training and resources. The arguments still go back and forwards as to who should provide the world population with food – the large scale farmers or the local farmers? If one could conceptualize the global system as being like an hour glass. One side is the producer and the other side the consumer. In the middle, where it is very narrow, is the market place. This is where socio/politico/economic structures exist. This structure is basically hedonistic in orientation. It is here that all the political ‘isms’ and economies operate and control the various market forces. Several years ago Bhutan looked at the problem with their country and many of the ministers realized that the urban migration was the main problem that they faced and so they looked at way to stem that flow. The main culprit they saw was the education system in their schools. As it was western orientated they realized that it was primarily urban based so they began to look into redesigning the curriculums and syllabuses to be more rural in orientation and containing subjects such as agriculture / environmental studies / social studies etc. If one was to look at the daivi varnashram system of ancient India we will find that it is ‘Agrarian’ in orientation. That is farm based. The Industrial Revolution meant the demise of both the Kingly and Agrarian cultures. That is the Kshatriya and Vaisya Cultures. With the formation of the secular state the loss of the Brahminical culture was realized and the overthrow was complete. Now with the Sudra culture in control it naturally meant hedonism was the driving force. Human senses now assumed control. So the modern industrial system is the best way for that to be facilitated. The transformation of the service ideal of a Sudra into the ideal of a greedy consumer was the greatest achievement of post industrial consumer based society. This is precisely what the Demon Kali needed in order to create the perfect environment for his rule. The social order has been turned upside down. The Ksatriya role in society has been taken over by the sudra class. The sudra class does not have the ability to appropriately deal with wealth and power. The manner in which they rule would have no true philosophical basis, and so quarrel and of course hypocrisy would predominate. Srila Prabhupada knew that the diavi varnashram would be in decline and the Vaisnava culture would have to be strengthened in order for it to become influential so he gave us the mission to reinstall the daivi varnasram system. Only then can human society have an effective system in order to facilitate a more easy transition back to Krsna. All the varnas are in existence and all that is needed is for us to reorganize accordingly. This is the Kali-yuga and that means the time of quarrel and hypocrisy which also means it is the time for the demon Kali to have his way. We must not underestimate the demon Kali and his ways. Even as far back as Maharaja Pariksit he planned and arranged for Maharaja’s death for he knew that he himself could not rule with a righteous King in control of the land. Change does not happen quickly and the demon Kali has 432,000 years of rule on earth. 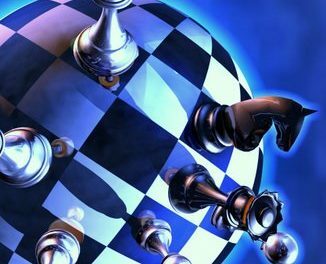 Through careful manipulation via his agents he has orchestrated and implemented his plan to rule over the last five thousand years. Now with the Monarchy to all extents and purposes dismantled and ‘isms’ such as Capitalism / Socialism and Communism in place he is assured of his rule. But Srila Prabhupada is the General of Lord Caitanya Sankirtana Army and The Lord also has His time/rule for the next ten thousand years. Srila Prabhupada’s ISKCON is the main and dare I say only bastion against the demon Kali having his full way in this world. For we are the only ones who know who Kali is and subsequently we know full well his plans and activities. 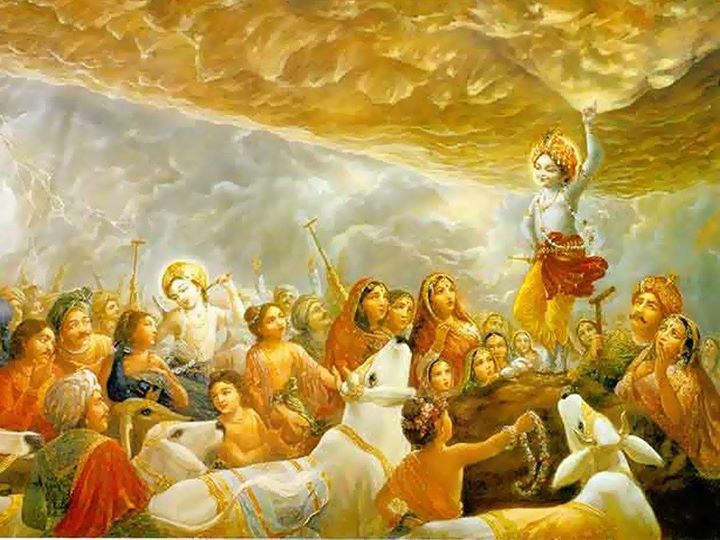 However, for the last thirty years we in ISKCON have been too busy centralizing authority, creating bureaucratic superstructures and adapting our infrastructure to the new urban bases system that we have all but forgotten establishing and promoting Agrarian culture. Our farming communities are nothing more than an afterthought. Most of them are being sold off or used to finance urban projects. Cows are not being properly protected and our Brahmins not listened to. The Bureaucrats have assumed the power and influence within our Vaisnava Society and as their way of developing our Movement has not to date been able to be supported by Vaisnava philosophy we have been lost in quarrel and argument and that is exactly his (Kali’s) plan. It is about time we reoriented our developmental thrust and began to steer our movement away from urban based projects, centralization of authority and the departmentalization of services and looked towards our Agrarian roots and Brahminical culture. We can then seek to advise the world leaders by the force of our realized Agrarian Religious lifestyle and philosophical orientation. Simple living and high thinking! This I believe will please Srila Prabhupada more. Please forgive my mistakes and inaccuracies, my intent is to open up discussions rather than write the perfect essay.